We have tabulated the award winners list manually. So, we might have missed a few contacts If you believe you should be on this list, please accept our sincere apologies and send us your log extract. We'll prepare and send your award straight away. Fenerlerle en çok sayıda bant üzerinden en çok sayıda görüşen on istasyona ayrıca faaliyetle ilgili özel bir DVD gönderilecektir. SWL'ler de aynı kurallara tabidir. Müracat için 31 Aralık 2011 tarihine kadar "Tevfik Aydın KAZANCIOGLU, PK 73 Karakoy 34421 ISTANBUL", adresine log özetinizle birlikte 10 TL veya 5 yeni IRC gönderin. Ödülünüzü pdf formatında almayı tercih ederseniz, log kayıtlarınızı e-posta ile ta1hz@tcswat.org adresine göndermeniz yeterli olacaktır. Ayrıca para ya da irc göndermeniz gerekmez. 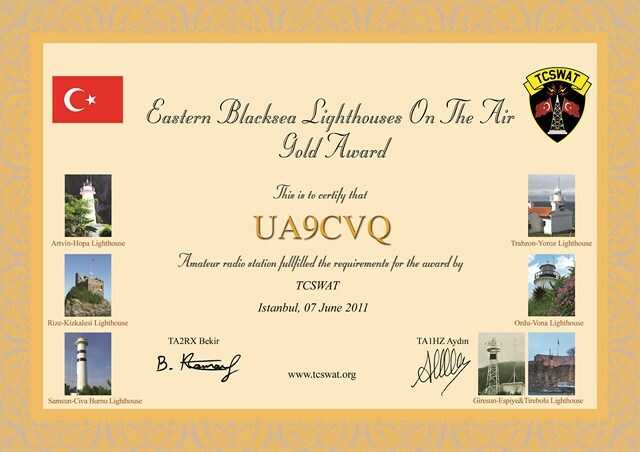 Top ten stations contacting the lighthouses with the maximum number of different bands will also receive a special DVD about the activity. Same rules apply to SWLs. To apply for the award, please contact "Tevfik Aydin KAZANCIOGLU, PK 73 Karakoy 34421 ISTANBUL / TURKEY", before 31 December 2011, enclosing your log extract together with 5 new IRCs or 5 Euros. If you would like to receive your award in pdf format, just e-mail your log exract to ta1hz@tcswat.org. You do not need to send any money or irc.